I know: I can’t think of a worse name for a soup, either. If someone I knew said they were serving this soup for dinner, it would almost assuredly be someone who sounded like my mother, and who would add on equally unappetizing statements like, It’s good for you. Or maybe something about how children in some other country were starving. Castor oil would undoubtedly enter the discussion. The first time I made this soup wasn’t quite that bad, but it wasn’t that good, either. I didn’t read the instructions completely, so I just roughly chopped up the cabbage instead of taking a bit of extra time and slicing it thinly as directed. Also, The Child got hungry, so I cut short the cooking time on the cabbage by about a half hour. Not my finest hour in the kitchen: the resulting soup tasted nutritious, in a drink-your-vitamins kind of way, and cabbage-y. Not horrible, to be sure, but nothing I really wanted to serve again. I couldn’t understand why Marcella Hazan would do that to me, so I tried again, and followed the instructions more carefully, allowing the thinly-sliced cabbage to cook as directed, over a very low heat, for a very long time. This time, it was all I could do not to eat all the cabbage right out of the pot. All of it. Now, I like cabbage, especially when it’s called sauerkraut and there’s a hot dog involved – this cabbage with nothing like that. It was meltingly soft and mild. You can make the cabbage ahead of time, if you can restrain yourself from eating it, and then finish making the soup whenever you’re ready. The soup is pretty straightforward. It’s very thick, closer to a risotto than a soup. I keeps well overnight, and the next day makes a superb lunch. It’s warming, and filling, and makes the whole house smell so good that you don’t mind being stuck indoors. And no guilt: it’s good for you. Call it whatever you want. I call it The Soup That Goes To Eleven. The original recipe is in Marcella Hazan’s Essentials of Classic Italian Cooking . I ran across it on Orangette, who read about it on The Wednesday Chef. 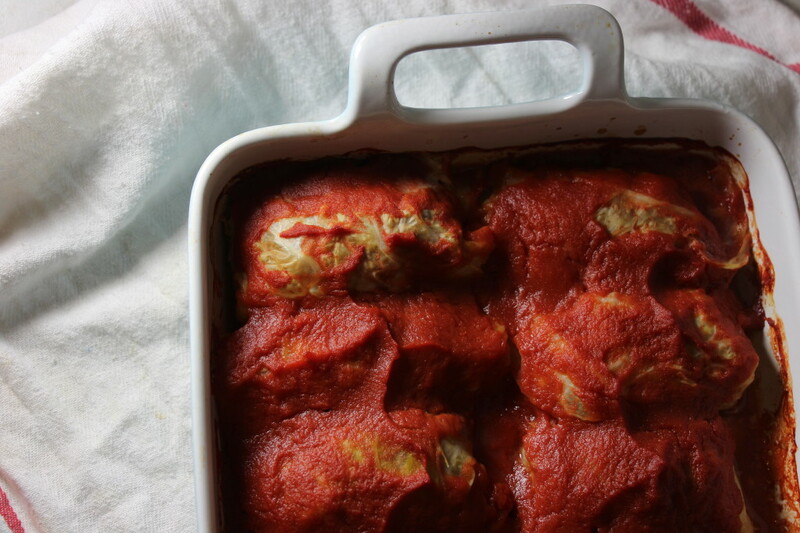 The recipe for Smothered Cabbage is here. In a large heavy pot , combine the cabbage, the broth, and 1 cup of water, and bring to a boil over medium-high heat. Stir in the rice, and then lower the heat so that the soup bubbles at a slow but steady simmer. Cook uncovered, stirring occasionally, until the rice is tender but firm to the bite, about 20 minutes. If you find that the soup is becoming too thick, add a little water. The soup should be pretty dense, but there should still be some liquid. 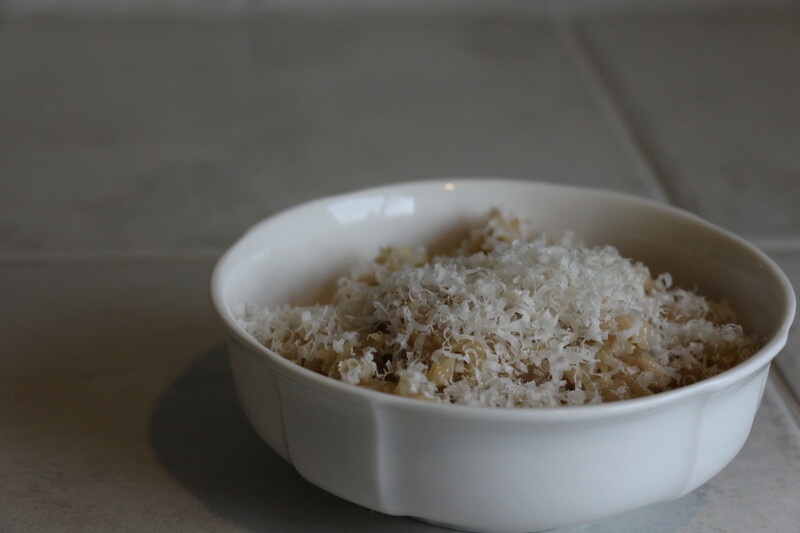 When the rice is done, turn off the heat, and stir in the butter and the grated Parmesan. Taste, and correct for salt. Serve with black pepper and more Parmesan. The original recipe calls for chicken or beef broth, which would be fantastic, but I always use vegetable broth, on the theory that there's a chance The Child will eat it. Eat this cabbage on it’s own, or use it to make Rice and Smothered Cabbage Soup, aka The Soup That Goes To Eleven. Put the onion and olive oil in a large heavy pot over medium heat. Cook and stir until the onion is pale gold, and then add the garlic. Continue cooking until the garlic is fragrant and looks cooked through, a few minutes. Add the cabbage, and stir a few times to coat with oil; then continue to cook until it’s wilted. Add a couple of generous pinches of salt, a grind or two of pepper, and the vinegar. Stir to mix, and then cover the pan and reduce the heat to the lowest setting. Cook, stirring occasionally, for at least 1.5 hours, or until the cabbage is very, very tender. If the pan seems dry at any point, you can add a tablespoon or two of water. When the cabbage is done, taste for salt, and season as needed. This cabbage can be made a few days ahead of the soup, if needed, and it also freezes nicely. DO slice the cabbage very, very thinly. DON'T cut short the cooking time. Trust me.